The first mythic race to be streamed. Last night, EU guild Method's hard work and dedication paid off as they secured the world-first kill of mythic G'huun, the final boss in Battle for Azeroth's first raid, Uldir. Method decided to add to the pressure, this time, by live-streaming their entire mythic progress—something that's never been done before. The gamble paid off with the final, world's first kill coming on the eighth day of raiding. You can see the reactions of the players in the video below—possibly a little NSFW! 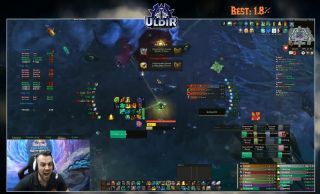 Mythic progress raiding is not for the faint-hearted, and the pressure was increased by US guild, Limit, who managed to nab the world's first kill on Uldir's seventh boss, Mythrax, followed by Method, 12 hours later. All seemed lost when Method failed to kill G'huun before the US server reset on Monday night—24 hours earlier than EU servers—giving Limit the opportunity to grab gear upgrades weekly caches and refresh their Vantus Runes, giving them a buff when going back against G'huun. Luckily for Method, Limit were unable to secure the kill, despite the early advantage. Method, from the EU server, Tarren Mill, are no strangers to the mythic progress race with G'huun bringing their world-first mythic kills on a final raid boss to ten.